Recently a contract has been signed between the ‘ Airport Express – Air & Rail Company (Pvt.) Ltd.’ of Malaysia and the Government of Sri Lanka to start an Electric Train System between Negombo and Colombo. The contract was signed by Dr.Shawana Khdir Ali President of Premiere Global Assets Ltd, and Dr.Parimalan Rajo Iso Michael (Managing Director of AEARC) with Newport Global Group Ltd (USA).On behalf of Sri Lankan Government, Minister of Finance Ravi Karunanayake participated to grace the occasion. Dr. Parimalan Rajo is having a special attachment to Sri Lanka as his mother hailed from Sri Lanka. His father was from India and in 1941 he had joined Indian Railways , later he had joined Sri Lankan Railways and when he was working in Sri Lanka he had met his wife. Dr. Parimalan Rajo , the present Managing Director of Airport Express Air & Rail Company (Pvt.) Ltd of Malasia is an expert in promoting and developing business concepts in Malasia, Thailand and Philippine. AEARC spends a sum of around 5 million US. 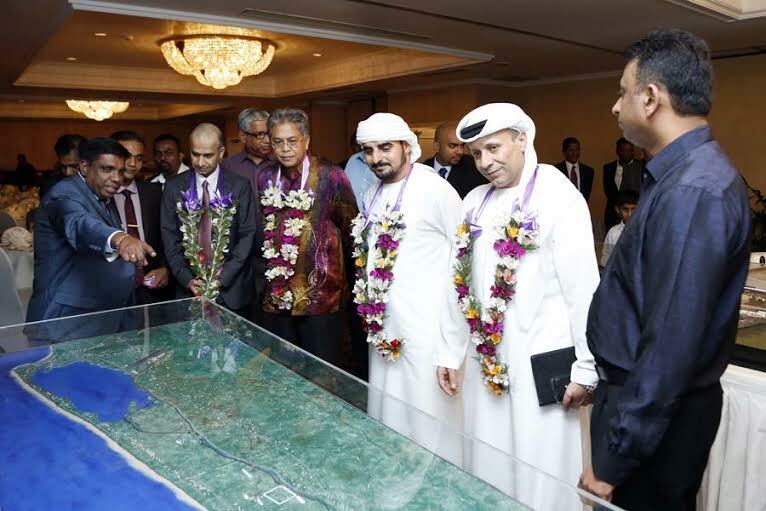 Dollars to carry out a detailed feasibility report on the whole project The construction work will be implemented once the green light is obtained for the commencement of the proposed project by the Sri Lankan Government. The proposed project is comprised of 42 k.m. stretch of rail track between Negombo and Colombo Fort. Two terminuses have already been identified to be built both at Katunayake Airport and Fort , Colombo. The track will be comprised of two parallel railway lines between the destinations. Cabinet approval has already been given to create two exit points in Bopitiya and Kerawalapitiya, facilitating more traffic access to Metro. Dr. Parimalan said “ Rapid –transit systems have been introduced worldwide to provide high-capacity public transport . It is an electric railwasy , characterized by high speed and rapid acceleration. He further emphasized Metro operated separately from other modes of transportation. “ They operate in tunnels, on elevated structures or at surface level, always with physical separeation from other traffic. to start a modern Township having all the novel facilities. Rules and regulations specified in the Gazette notification issued by the Lanad Registry in 1972 will be strictly followed on the development of proposed Township. An Architecture consultant from London is expected to be employed to construct the Township in accordance with the guidelines and specifications given in the Gazette notification.The proposed well-integrated township development covers 150 acres of residential and commercial land. Out of 150 acres of residential and commercial land more space which will be developed as landscape garden for recxreation. This project will also provide housing options for the prospective residents and serve as a hub of play activities and recreational facilities. The main land plots of the “ Eco City “ are planned to be developed within this year (2015) . The overall devcelopment is expected to be completed by the yera 2018. Total of 3050 apartments are also included in the project. Approval from BOI for the implementation of ther “ Bopitiya Township project has already been obtained. The total value of the investment will be around USD 450 million .